”Gagged in horror” is the only way I can describe my reaction when I saw how much butter goes into one of the pastry recipes provided in Household Management. INGREDIENTS – To every lb. 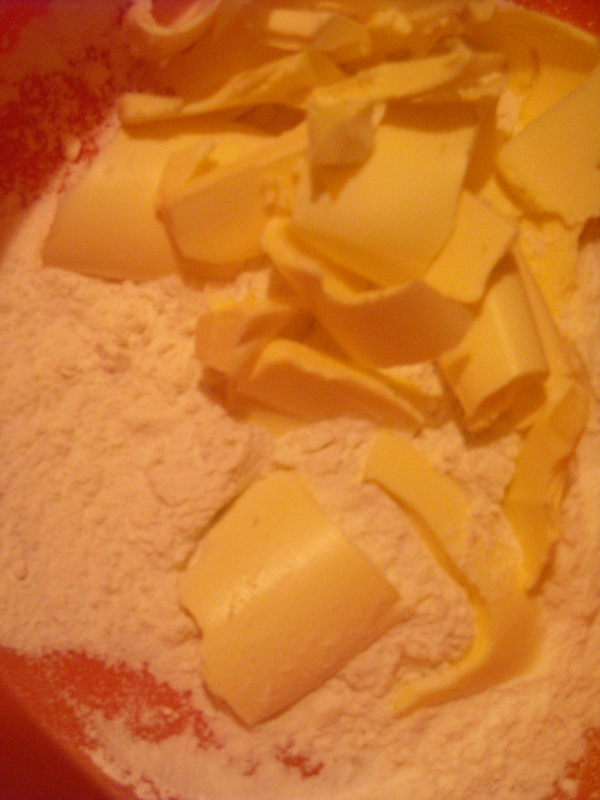 of flour allow 3/4 lb. of butter, 1 tablespoonful of sifted sugar, 1/3 pint of water. Even though I only made a quarter of the given ingredient quantities (there are only 2 of us), there was still quite enough butter waiting to be rubbed into the flour, thank you very much. As crazy as it sounds, the pastry was absolutely beautiful to work with – the Nigella Lawson of the pastry world. The butter gave it a soft, smooth texture and made it tremendously easy to roll it out. Once cooked, it looks like a cross between shortcrust pastry and puff pastry, which I liked. We had a couple of jars of cherries in the kitchen that I wanted to use up (normally I prefer fresh, seasonal stuff, but my boyfriend is mad about – and I mean mad about – Cherry Cheesecake made from a Canadian packet mix. In a nearly fruitless – you’ll forgive the pun – search to find canned cherries in a sweet enough sauce to please His Cheesecake Highness, the jars were consigned to the kitchen cupboards when a suitably sweet contender was found). 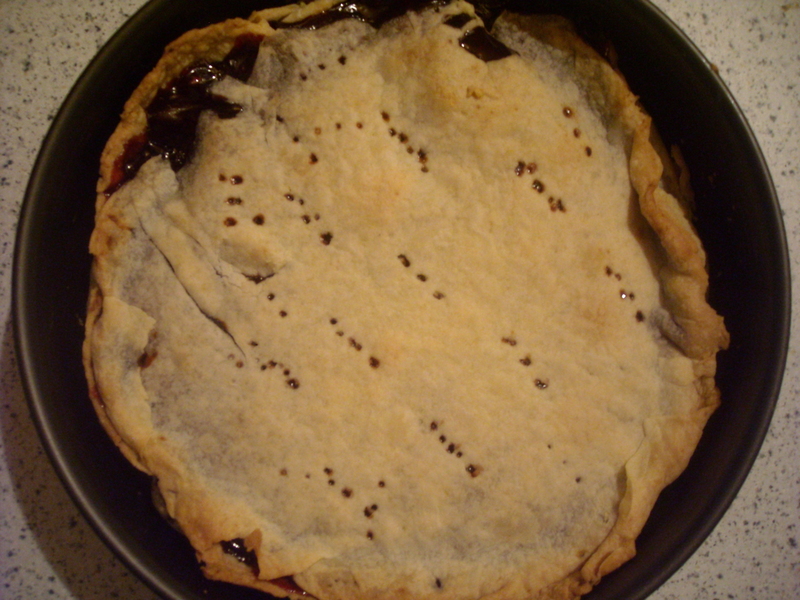 I had a hankering for Cherry Tart and, as per usual, turned to Mrs Beeton for advice. INGREDIENTS – 1–1/2 lb. of cherries, 2 small tablespoonfuls of moist sugar, 1/2 lb. of short crust, No. 1210 or 1211. As I’ve already confessed, the cherries I used were not exactly picked yesterday. My boyfriend happened to walk in just as I was putting it in the oven. “You know that’s all liquid, right?” he back-seat baked at me. He shook his head at me, unconvinced. But of course, I knew better. 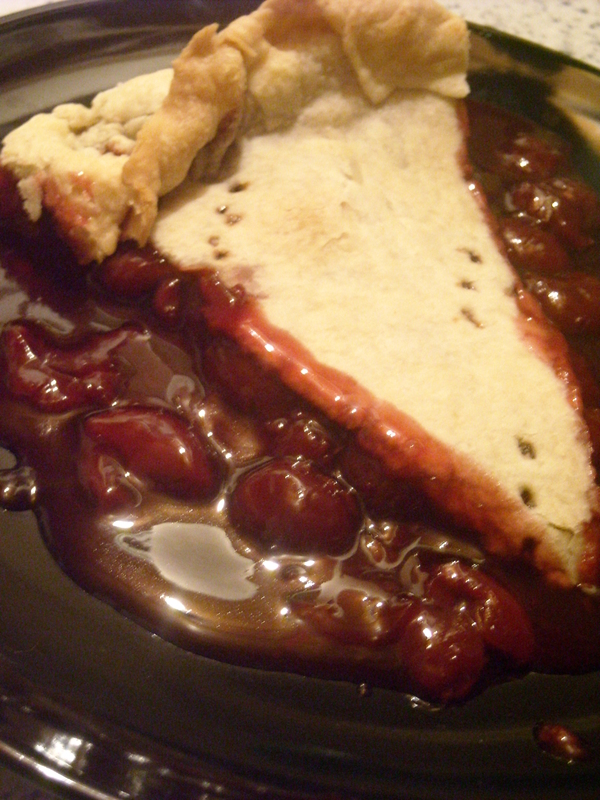 On the plus side, I enjoyed the unexpected tartness of the cherries. “Do you like the pie?” I enquired as we started to tuck into it. Although I wouldn’t admit it to his face, I have to agree – for once he’s absolutely right. This entry was posted on January 27, 2010 at 10:33 pm and is filed under food. You can follow any responses to this entry through the RSS 2.0 feed. You can leave a response, or trackback from your own site.